A “designer” or “synthetic” drug is a structural analog of a controlled substance that mimics the effects of the substance while avoiding classification as illegal. Synthetic copies of pharmaceuticals are common in erectile dysfunction, birth control and performance enhancement. The latter can avoid detection in standard drug tests. Topicals are one of the newest risks to acquirers. This category consists of mostly dermatological type products, many of which are banned or are only available with a prescription. The G2 analyst team has compiled a list of the trending products in this tricky area. 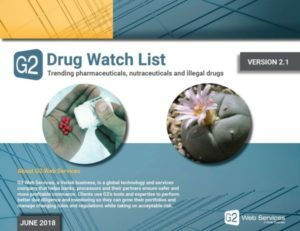 This watch list is a great tool to incorporate into underwriting and boarding processes, as well as when conducting investigations on merchants. Print them out and share them with your team. If you ever have any questions about any of the above products, please contact us at info@g2llc.com.